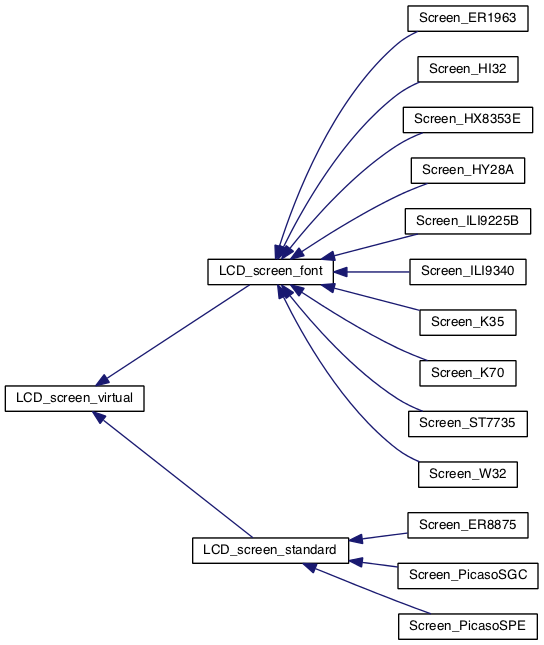 The LCD_screen Library Suite has evolved with a more mature structure. It relies now on a core abstract base class (with pure virtual functions). Two classes are derived from the abstract base class with or without the graphic and text primitives depending on the kind of screens. Each screen uses one of the derived classes and only needs to redefine 4 functions --initialise, define area, write pixel, read pixel. This allows easy maintenance and fast implementation for a new screen, but requires more memory for the virtual functions tables.